Motor vehicle injuries are currently the leading cause of death for American Indian and Alaska Native children. The use of child safety seats has been proven to reduce child injury and death by 71% for infants and by 54% for toddlers (1-4 years old) in passenger cars. Booster seats reduce the risk of serious injury by 59% and seat belts reduce injury risk by 69%. to improve the use of child passenger restraints in six Northwest tribes. In its current phase, the study aims to develop and facilitate the use of a dissemination platform that will translate the successful protocols, tools and intervention materials used by Native CARS tribal partners for use by other Tribes. It is intended that this dissemination platform, the Native CARS Atlas will serve as a blueprint for other Tribes to address child passenger safety concerns in tribal communities. Visit the Native CARS Atlas at: www.nativecars.org and follow us on Facebook & Twitter. Given the high mortality rate of American Indian and Alaska Native children in motor vehicle injuries, the goal of NPAIHB’s CARS Program is to increase the use of child safety restraints, and therefore decrease this excessive mortality rate. Disseminate complete and accurate protocols, tools and intervention materials concerning child safety seat use. Compile safety records and data to make informed decisions about program and policy goals. These same six tribes continued to work with the NPAIHB investigators and research team (Lapidus, Lutz, Ebel and Smith) to develop and submit study grant proposals to fund interventions to address this disparity. In 2008, the Native CARS study was grant funded by the National Institute on Minority Health and Health Disparities (NIMHD), and is a partnership with the Northwest Portland Area Indian Health Board, University of Washington, and six Northwest tribes. With a staggered intervention phase study design, all six participating tribes received community-based interventions. Three received the interventions in phase 1, and the remaining received the interventions in phase 2. We collaborated with the tribal communities to develop interventions that would be meaningful and suited to each community. We evaluated child safety seat use in the community both before and after the intervention phases to see if the interventions had an impact on motor vehicle restraint use in the community. The goal of the Native Children Always Ride Safe (Native CARS) project was to prevent early childhood vehicle collision morbidity and mortality in American Indian and Alaska Native children through the use of a community based participatory model that incorporated tribal differences in cultural beliefs, family and community structure, geographic location, law enforcement and economic factors. Because of the demonstrated success of the Native CARS Study, the study was award additional funds for a dissemination phase of the study, where the protocols, tools and intervention materials can be translated for use by other tribes both locally and nationally. These evidence-based tribal interventions will be adapted and disseminated via plans guided by a dissemination framework that leverages and expands upon tribal capacity built during the previous Native CARS cycle, by engaging the tribal participants as experts throughout this phase. Demonstrating the translation potential of Native CARS interventions into other tribal communities is an essential step toward reducing the disparity in motor vehicle injuries and fatalities experienced by American Indian and Alaska Native children in the United States. 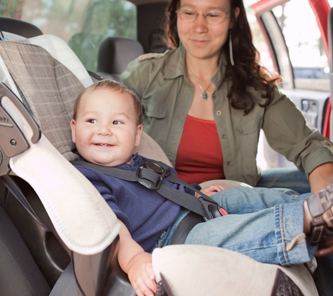 Develop the Native CARS Atlas, a toolkit to assist tribes in implementing and evaluating evidence-based interventions to improve child passenger restraint use on or near tribal lands. Facilitate the use of the Native CARS Atlas in the six tribes that participated in the original initiative, to help sustain improvements in child passenger restraint use achieved during the intervention phase and provide lessons on use of the toolkit for other tribes.